Metalformers performing general fabrication and arc welding compile a long laundry list of tasks around the shop requiring grinding and finishing, including removal and blending of die marks, light to heavy stock removal in the toolroom, weld blending and polishing and fine-tuning of die surfaces. 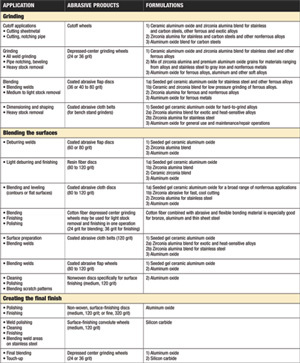 To select the right abrasive product for the job, the accompanying Abrasive Selection Guide covers a lot of ground; to hit the highlights, MetalForming spoke with an expert in the use of coated abrasive products—Dave Long, director of marketing, strategy and marketing information for Norton Abrasives. 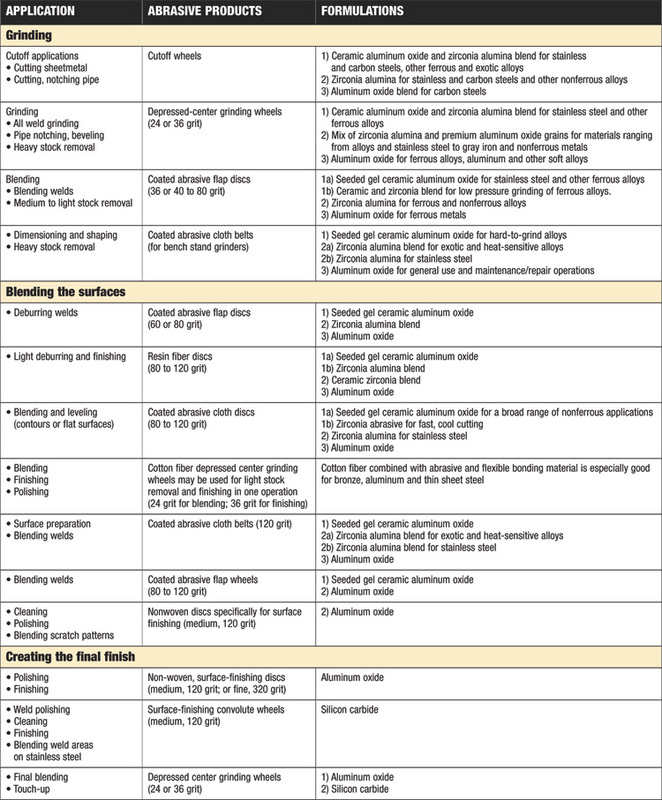 Manufacturers of grinding and finishing products offer abrasives of varying types and grit sizes in four different types of substrate, selected for the task at hand: grinding wheel, flap disc, fiber disc and nonwoven products. 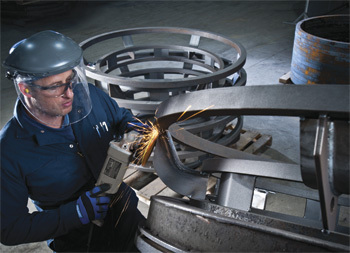 At one end of the finishing spectrum, grinding wheels offer heavy stock removal; at the other end, nonwoven products allow fabricators to polish and finish, remove oxidation and corrosion—surface preparation without disturbing the material surface. Not all abrasives perform the same, and Long explains why. The performance improvement comes from the the abrasive grains perform in service. Grind with a wheel loaded with aluminum oxide and you’ll note large chunks of each grain fracturing a, while ceramic-alumina abrasive is designed to microfracture. As the grains fracture, tiny pieces are expelled to provide a continuous supply of sharp cutting edges. This translates into faster cutting and longer wheel life. For shops working with softer materials such as aluminum alloys, abrasive-product manufacturers have you covered as well. The key here is to use a finishing product that resists loading, or won’t become “gummed up” with the workpiece material. Thanks for the auspicious writeup. It in reality was once a entertainment account it. Glance advanced to far delivered agreeable from you! However, how can we keep in touch? I have been looking for the right abrasive for my project right now. I am trying to smooth out some pretty hard wood, and I think that I will need a pretty hard abrasive. Otherwise, I don't think it will effect it very much. And as far as it goes for wheel or disc, I have no idea. I will need to get some advice on that!